Fine Edge Furniture designs, manufactures and installs exquisite bespoke kitchens and furniture, made from the finest materials. At Fine Edge Furniture there are no standard sizes or designs, anything is possible. Styles range from classic to the contemporary, utilising the highest quality of materials, natural wood and painted finishes are completed in our workshops. Straight lines curve gracefully into islands or breakfast bars to create the bespoke kitchen of your dreams. We offer a tailored design service taking projects from concept to final completion at the highest possible standard. Our artisan furniture designs are founded upon many years of experience in cabinetry & bespoke furniture. We take our clients from a blank canvas position to where the finished product is created & delivered on budget to exceed beyond expectation. Our commitment to excellence in construction & service enables us to supply you with a product that is truly unique. For the very highest standards of bespoke kitchen manufacture and installation, get in contact with Fine Edge Furniture today. Fine Edge Furniture can provide a wide range of appliance to meet your needs, from the main appliances such as refrigerators, cookers & dishwashers to the very latest in advanced appliances such as built in coffee machines, instant boil taps & pop-up power outlets. In most cases we can offer them at a lower cost than many other providers as we do not require the excess margins that retailers do. Fine Edge Furniture was founded in February 2008 by Sean Cash. He has been working as a designer and cabinet maker since the beginning of his apprenticeship in 2002. 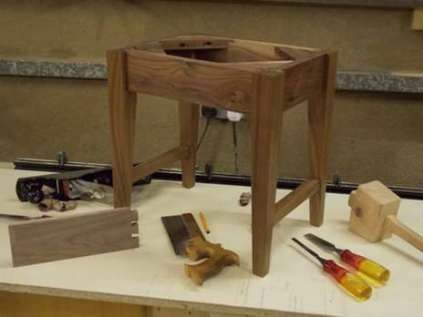 During this time Sean worked with two leading Wexford based furniture design companies. The first company’s main business focus was private residential, manufacturing handcrafted kitchens, wardrobes and other fitted furniture. The second company that Sean was employed by mostly worked in the commercial sector, hotels, bars, restaurants, retail and offices, manufacturing unique interior furnishings and specialised fit outs, throughout Ireland. The years from 2005 to 2007 Sean received a number of accolades/awards & achievements in Cabinet Making. 2006/2007 ‘Student of the Year’ at Dun Laoghaire College of Further Education. Fine Edge Furniture designs, manufactures bespoke furniture and commissioned joinery pieces from our fully equipped workshop based in Blackwater, which range from high quality solid wood frame kitchens to finely crafted individual pieces for home or commercial premises. Our reputation is based on quality and attention to detail, pride in our work, and our ability to meet our client’s needs within their budget.